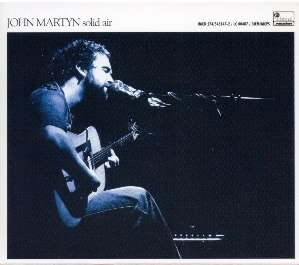 I first met John Martyn in New York while engineering the sessions for Stormbringer. Joe Boyd’s Witchseason label had originally signed Beverley as a solo artist before her marriage to John; after working on the subsequent John and Beverley album Road to Ruin Joe’s parting gift to me on leaving Britain and returning to the States in 1971, was to produce a solo John Martyn album. The album, to cost less than £2,000, was intended to fulfil John and Beverley’s contractual obligations. Over the four albums I worked with John, both as engineer and producer, I never got the impression he was particularly satisfied with any of them, and so was surprised when in Autumn 1972 John called me about working with him again. In the intervening year he had recorded a single version of May You Never and been working in the studio with several line ups attempting to make his next album. To record what would become Solid air we took a week in Sound Techniques, and John, keen to use fresh faces, booked a few players, including a bass player he was very enthusiastic about. After the extraordinary rapport John had previously enjoyed with Danny Thompson I was puzzled by his choice and during the first nights recording felt that he might have made a mistake. Fate then took a hand, Sound Techniques had a notorious staircase down to the studio from the loo and kitchen above, that first night I managed to trip two thirds of the way down it, landing in the studio with a very twisted ankle. Unable to work for a week or so we had to re-schedule the sessions at Island’s Basing Street Studios and re-book musicians, with John’s original bass choice being unavailable Danny returned to the fold. As with Bless the weather tracks were recorded live with few overdubs, in around eight days. Many artists I have worked with since find it difficult to believe that an album of this musical stature and integration could have been made so quickly. Fortunately John was working with musicians who quickly understood the shape and form of his songs, not easy when you realise that John’s guitar would be in his own tunings which Rabbit and Danny then would have to transpose for their normal concert tunings. It would be hard to overestimate the contribution of Danny Thompson to Solid air, and his performance on the title track (Sausages as he and John used to refer to it) is some of the greatest bass playing I ever recorded. The rapport between John and Danny on this album precipitated their legendary live concert appearances. The often undervalued keyboard work of John Rabbit Bundrick set up much of the mood and texture on the album. Rabbit, a Texan who arrived in Britain by way of being a sideman for Johnny Nash, along with Bob Marley was the perfect foil for the more traditional acoustic background of the other players.